Water has been associated with Judaism since time immemorial; even the word Hebrew, in Hebrew (“Ivrit”) comes from the ancient word meaning… river. (The Jews were literally, the people who lived by the river!). Water symbolizes life and health and cleanliness in Judaism, since the flood era filled the earth with water to clean out the world. 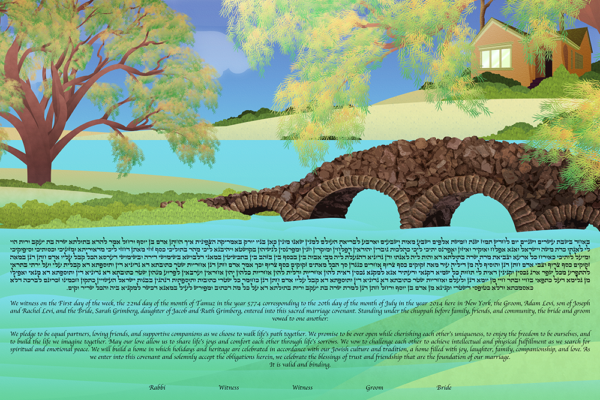 The By The Lake Ketubah is perfect for the couple who not only loves the symbolism of the water, but for the couple who flow in and out, up and down together. The couple who doesn't mind a splash or getting wet — whether it is for fun or to clean yourself after having done the hard work of building a life together. The couple who wants to build a bridge over the water towards a great future, together.